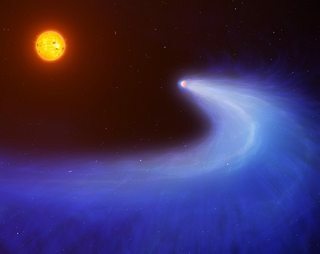 Using data provided by NASA/ESA’ Hubble Space Telescope, an international team of astronomers have discovered an amazing and rare exoplanet (a planet outside the solar system) with a giant comet-like tail. The tail is formed from an enormous cloud of hydrogen dispersing from the Neptune-sized world, a tail that makes the planet to resemble a comet. The weird find is the first of its kind, such phenomenon has never been seen around an exoplanet, astronomers says. This phenomenon could help astronomers not only to explain the formation of hot and rocky “super-earths” but can also be used to look for signs of watery oceans boiled off on exoplanets beyond our solar system. Scientists believe that this discovery can also be used to predict the future of Earth’s atmosphere, 4 billion years from now. I was astonished by the mere size of the cloud of gas escaping from the planet. Said David Ehrenreich ~ lead author of the new study published in the journal Nature. With a mass of about 23 times the mass of Earth, this weird world is located 33.4 light-years away in the constellation Leo, orbiting very close to its red dwarf star — 33 times closer than the Earth orbits the Sun. Called Gliese 436b, it is categorized as a warm Neptune (same size as Neptune but it is much closer to its star than the icy Neptune is to the sun). Gliese 436b is completing an orbit around its star every three days, as a result, it leaves behind a gigantic trail of hydrogen, which is about 50 times the size of the host star. Explained Dr. Peter Wheatley ~ co-author of the study. The cloud forms a comet-like tail as a result of UV light coming from the star pushing on the hydrogen and causing it to spiral outwards. Only by using the Hubble Telescope, scientists were able to spot the shadow of this hydrogen cloud, as it obscured the view of the star. You would have to have Hubble’s eyes. You would not see it in visible wavelengths. But when you turn the UV eye of Hubble onto the system, it’s really kind of a transformation, because the planet turns into a monstrous thing. This cloud of hydrogen is very spectacular. Although the evaporation rate doesn’t threaten the planet right now, we know that the star was more active in the past. This means that the planet’s atmosphere evaporated faster during its first billion years of existence. Overall, we estimate that it may have lost up to 10 percent of its atmosphere. Escaping gas has been seen in the past for larger gas giant exoplanets, so it was a surprise that looking at a much smaller planet resulted in such a big and stunning comet-like display. Said Professor David Sing ~ also co-authored the study. This type of observation is very promising in the search of habitable planets since hydrogen from the ocean water that evaporate on slightly hotter terrestrial planets than the Earth could be detected. The phenomenon might even explain the disappearance of hydrogen outside our atmosphere, an element that abounded there more than 4 billion years ago. Finding the cloud around Gliese 436b could be a game-changer for characterizing atmospheres of the whole population of Neptunes and super-Earths in UV observations. Featured image: © 2014-2015 Fiend-V.